You might be familiar with CSA (Community Supported Agriculture) shares from vegetable farms, and we're extending this model of shared risk and shared reward to our flowers as well. That means you pay up front for a weekly share of our harvest throughout the growing season, which will take the form of a fresh, unique bouquet of flowers that reflects the season. As the color, variety, and size of our harvests increase, so will your weekly flower arrangements; if we're blessed with a long and bountiful growing season, your kitchen table will be likewise blessed. By investing in our farm through CSA, you also give our farm operating funds early in the year (when we need them most), and more importantly, you bear some of the risk that's inherent in farming of any kind by ensuring a portion of our income even if a windstorm takes out a few beds of sunflowers in their prime. In 2019, our Full Shares will run 14 weeks from approximately July through September, and Half Shares will be delivered every other week during that same period. We are currently only delivering to Northfield, where we partner with some of our local veggie CSAs so you can get your flowers and your produce at the same time. Sales tax is included in these prices. 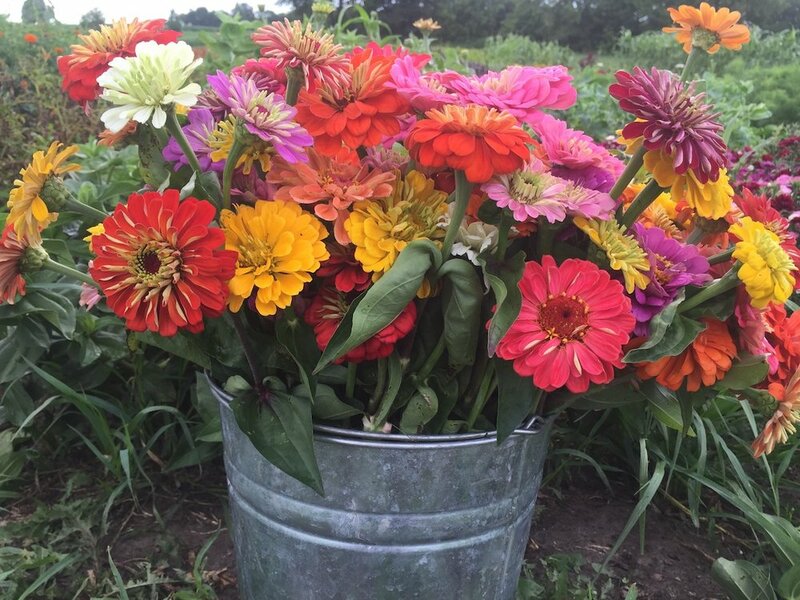 Flower shares are delivered to drop sites by 1PM or by the start of your farm's normal CSA pickup hours. If you have questions about the CSA before you sign up, please use our general inquiry form here. If you're ready to sign up for our CSA, just follow the link below. You can pay online now for an additional 6% service fee or mail in a check.